TheGunBlog.ca — Canada’s federal government is examining how to give municipalities more power over firearms, a governing member of parliament said in a flyer for a public meeting with the minister studying new gun bans. “The Prime Minister has acknowledged that our government is examining a number of additional ways to tackle the issue of gun violence and crack down further on handguns, including empowering municipalities to do so,” said the poster from Liberal Party MP Nathaniel Erskine-Smith. Shooting is one of Canada’s safest and most-popular sporting activities. More Canadian men and women have a firearm licence than play hockey. All levels of government make policy aimed at firearm users. Federal: Laws on who is allowed to own, use, buy, sell and transport guns are in the federal Criminal Code and Firearms Act. The Liberals in 1995 made it a federal crime for anyone to own a gun without a licence authorized by the federal police. Provincial: Provincial Chief Firearms Officers work with the federal government to license owners, register firearms, authorize shooting ranges and decide who is allowed to transport guns to the range. Provinces regulate hunting. Municipal: Municipalities decide whether gun stores and ranges are allowed to operate by granting business licences and ruling on noise levels. Municipal police enforce municipal, provincial and federal laws. Prime Minister Justin Trudeau has to calculate whether new prohibitions aimed at millions of hunters and sport shooters will win votes for the Liberals in the next election. He is already pushing new restrictions and confiscations through Bill C-71. 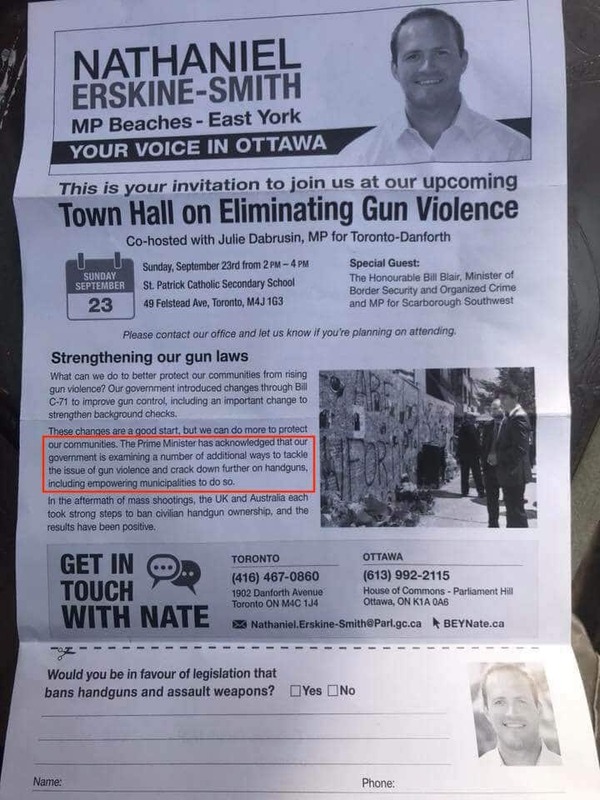 The flyer from Erskine-Smith advertises a public meeting in his Toronto electoral district on Sept. 23 with Bill Blair, the minister examining a “full ban” on handguns and other firearms held by licensed owners. All other private guns are banned already. Erskine-Smith’s office and the prime minister’s office didn’t reply to questions from TheGunBlog.ca about the examination of new municipal powers over firearms. Toronto City Council voted in July to ask the federal government to end the civilian ownership of handguns and semi-automatic rifles and shotguns in Canada, and the mayor asked licensed firearm owners to go somewhere else. Montreal and Quebec City followed Toronto’s lead. A rising number of political leaders, police leaders and individuals across the country are speaking against new prohibitions aimed at licensed shooters. Firearm policy has also divided Liberal members of parliament.